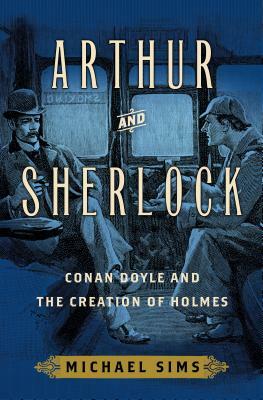 Arthur and Sherlock: Conan Doyle and the Creation of Holmes (Hardcover) | Eagle Harbor Book Co.
From Michael Sims, the acclaimed author of The Story of Charlotte’s Web, the rich, true tale tracing the young Arthur Conan Doyle’s creation of Sherlock Holmes and the modern detective story. As a young medical student, Arthur Conan Doyle studied in Edinburgh under the vigilant eye of a diagnostic genius, Dr. Joseph Bell. Doyle often observed Bell identifying a patient’s occupation, hometown, and ailments from the smallest details of dress, gait, and speech. Although Doyle was training to be a surgeon, he was meanwhile cultivating essential knowledge that would feed his literary dreams and help him develop the most iconic detective in fiction. Michael Sims traces the circuitous development of Conan Doyle as the father of the modern mystery, from his early days in Edinburgh surrounded by poverty and violence, through his escape to University (where he gained terrifying firsthand knowledge of poisons), leading to his own medical practice in 1882. Five hardworking years later--after Doyle's only modest success in both medicine and literature--Sherlock Holmes emerged in A Study in Scarlet.Sims deftly shows Holmes to be a product of Doyle’s varied adventures in his personal and professional life, as well as built out of the traditions of Edgar Allan Poe, Émile Gaboriau, Wilkie Collins, and Charles Dickens--not just a skillful translator of clues, but a veritable superhero of the mind in the tradition of Doyle’s esteemed teacher. Filled with details that will surprise even the most knowledgeable Sherlockian, Arthur and Sherlock is a literary genesis story for detective fans everywhere. Michael Sims is the author of The Story of Charlotte's Web, which the Washington Post, Boston Globe, and other venues chose as a Best Book of the year; Adam's Navel, which was a New York Times Notable Book and a Library Journal Best Science Book; The Adventures of Henry Thoreau; and other books. He edits The Connoisseur's Collection series of Victorian anthologies, including The Dead Witness (detective stories), and also edited The Penguin Book of Victorian Women in Crime and The Penguin Book of Gaslight Crime. His Sherlockian pastiche “The Memoirs of Silver Blaze” appears in the Anthony Award-winning anthology In the Company of Sherlock Holmes. He lives in western Pennsylvania with his wife and son.